In 1957 the garden dojo moved to a permanent building called the Jundokan. Hiagaonna Sensei continued his training there, five hours every day. After his instructor, Anichi Miyagi Sensei moved away to work on an American oil tanker Higaonna Sensei gained a place at the Takushoku University in Tokyo, it was around this time that the first official Dan grading was organised. Higaonna Sensei was awarded 3rd Dan. The year was 1960. It was in Tokyo that Higaonna Sensei taught at the famous Yoyogi Dojo. Many thousands of students passed through this dojo. 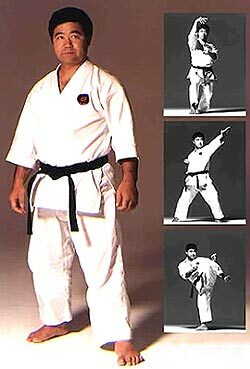 Some of the more notable Senseis´ were Ogawa, Todano and Terauchi; from the West, Ernest Brenech, James Rousseau, Bakkies Laubscher; and from Shotokan Karate, Terry O´Neill.